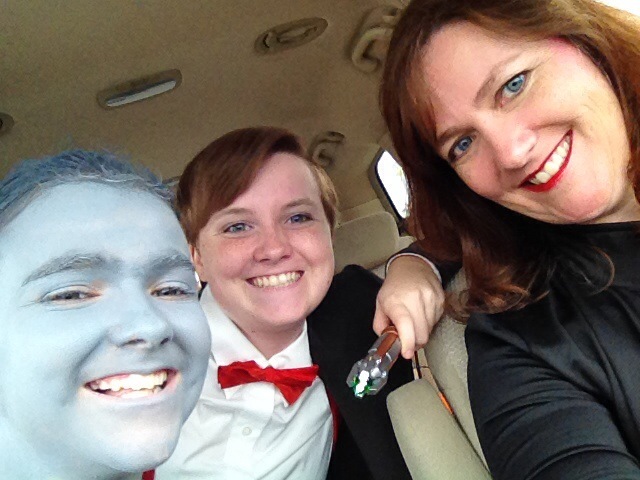 Last year, my friend got our family into Doctor Who. I discussed this a bit in a Quick Takes, when I explained that the no-budget shows of the 1980’s didn’t endear me to this odd show, especially when no one explained to me exactly what I was supposed to be watching. But then came an episode where the Doctor was attempting to save a group of people by rectifying a “fixed point in time” that was messed up by interference by Rose. A pregnant woman was among those who was in danger, and he was insistent that the woman and her fiancé and their unborn child were important. They were worth saving! Time after time, the Doctor works to save as many people as possible, works for non-violent solutions to conflicts, and talks about the importance of every single life. The weight of the deaths of others is enormous on his shoulders (he is, after all, over 1000 years old now and has had more than a normal person’s share of death). He doesn’t want to kill anyone, even in situations where it seems he’d be justified. And so his punishments tend to be terrible, but not usually fatal. Again and again, the Doctor comes to the rescue of Earth, simply because he finds us worth saving – a place and people who he can love. He considers Earth “under his protection,” and wants the best for the people here. And then, shortly after crashing (and discovering he’s hungry), he proceeds to try to get a hold of what he likes to eat by putting a little girl through this? We came for the sci-fi, but we stayed because the Doctor isn’t just funny and chivalrous and charming, but because the Doctor believes that every life is important. Every human should have a chance to life his life. That’s something we can definitely agree on.